The soccer field has new residents. That is, what used to be the Forest Park soccer field. The new 10-acre Savanna expansion by the Fort Worth Zoo features rhinos, giraffes, hippos, and giraffes. The Fort Worth Zoo opened its new exhibit on Thursday and features an underwater hippo viewing area, a playground for meerkats, Southern Black Rhinos, an exotic bird aviary. Soon zoo visitors will be allowed to feed the giraffes, which is sure to be a hit. The zoo raised the funds for the first phase a $100 million renovation through private donations, including four new major exhibits at the zoo. One new exhibit is to be added every two years for the next six years. All of the money was raised through private donations, said zoo spokeswoman Alexis Wilson. Sitting on 10 acres of existing Zoo land, guests will be able to stroll through the African Savanna and see giraffes, zebras, ostriches and more in one exhibit. This habitat will be surrounded by shaded walkways and aviaries with a variety of bird species for Zoo visitors to discover. The exhibit will also include an elevated deck for giraffe feeding, restaurants and shaded viewing areas, private event space and much more. A trip through the African Savanna will give guests multiple panoramic views to watch several species interacting and sharing an exhibit. Zebras, two African antelope species (lesser kudu and springbok), reticulated giraffes and a variety of large African birds will share this open space modeled after the spacious African grasslands. The Giraffe Encounter will allow guests to stand eye-to-eye with a herd of giraffes and feed these gentle giants directly from the raised observation deck, making for an unforgettable experience. Mimicking the natural African environment, many of these exotic animals will roam freely together in the main savanna that will include multiple watering holes, shaded areas and a dry stream bed. This exhibit will be completely surrounded by observation decks and walkways. Varying shades of pink will accent the Savanna’s watering holes as flocks of greater and lesser flamingos will socialize in the water. Additional aviaries will sit amidst the African Savanna flora. Hippos will drift, float and swim through a lazy river among thousands of small, multi-colored cichlids, as the generated current creates a true, constant flow, akin to the rivers and streams that run through Africa. Guests can enjoy watching the Zoo’s hippos from ground level as well as from down below. The 70-foot-long underwater viewing area will allow for an up-close-and-personal experience with the animals while they are fully submerged, as hippos spend most of their time underwater. Advanced filtration technology promises crystal-clear viewing beneath the surface, enhancing the viewer’s experience. Southern black rhinos roam the perimeters of the savanna. Guests can observe these magnificent animals from multiple viewing areas surrounding the habitats. 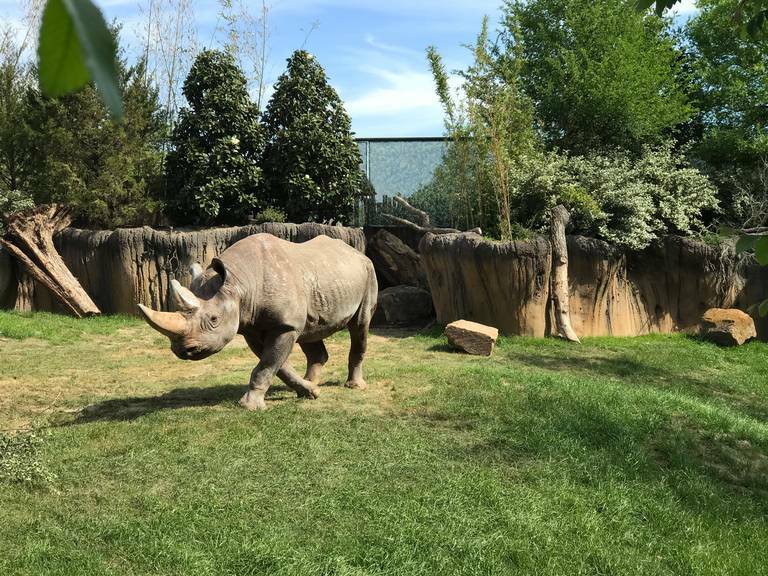 Expanded exhibit space for this endangered species will allow the Zoo to continue its renowned southern black rhino breeding and conservation program. Just across the brush, a mob of meerkats will also call the savanna home. The Fort Worth Zoo is ranked as a top five zoo in the nation and the Fort Worth Zoo president, Ardon Moore, said they are confident that the changes and improvements will continue to elevate their profile as a top-ranked zoo.